The main figure in the revolutionary movement that overthrew imperial rule was Sun Yat-sen (1866--1925), who, along with other republican political leaders, endeavored to establish a parliamentary democracy. They were thwarted by warlords with imperial and quasi-democratic pretensions who resorted to assassination, rebellion, civil war, and collusion with foreign powers (especially Japan) in their efforts to gain control. Ignored by the Western powers and in charge of a southern military government with its capital in Guangzhou, Sun Yatsen eventually turned to the new Soviet Union for inspiration and assistance. The Soviets obliged Sun and his Guomindang (Nationalist Party). Soviet advisers helped the Guomindang establish political and military training activities. But Moscow also supported the new Chinese Communist Party (CCP), which was founded by Mao Zedong (1893---1976) and others in Shanghai in 1921. The Soviets hoped for consolidation of the Guomindang and the CCP but were prepared for either side to emerge victorious. The struggle for power in China began between the Guomindang and the CCP as both parties also sought the unification of China. Dr. Sun Yat-sen was a the reformer and revolutionary who spent his life trying to bring down the corrupt Qing dynasty and replace it with a democratic government. He is revered by both Communist mainlanders and Nationalist Taiwanese as the father of 20th century China. Sun Yat-sen's picture is on Chinese banknotes. Sun, whose original name was Sun Wen, advocated "the Three Principles of the People: nationalism, democracy and the people's livelihood." Regarding nationalism, Sun aimed to guarantee people's political rights, including the right to vote, establish parliamentary democracy and ensure the separation of administrative, legislative and judicial powers. Books: 1) The Opium War: Drugs, Dreams and the Making of China by Julia Lovell (Picador, 2011); 2) China: Alive in the Bitter Sea by Fox Butterfield; 3) China: A New History by John K. Fairbank; 4) China's Imperial Past: An Introduction to Chinese History by Charles O. Hucker; 5) In Search of Modern China by Jonathan D. Spence; 6) The Chan's Great Continent: China to Western Minds by Jonathan Spence (Norton, 1998). 7) Cambridge History of China multiple volumes (Cambridge University Press). 8) Shark Fins and Millet is an excellent depiction of China in the 1930s by Polish-born journalist Ilona Ralf Sues, who met up with Big-Eared Du and Madame Chiang Kai-shek. You can help this site a little by ordering your Amazon books through this link: Amazon.com. 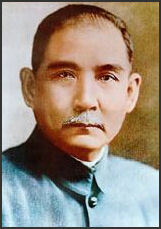 Sun Yat-sen was born in Guangdong province on November 12, 1866 into a farming family. He studied for a few years in Chinese schools. At the age of 13 he moved to Hawaii, where his elder brother had emigrated. He studied there at a boarding school run by the Anglican Church. Sun Yat-sen later moved to Hong Kong. He spent more than a decade there, was baptized as a Christian and graduated from the the Hong Kong College of Medicine in 1892. He practiced medicine briefly in 1893. Sun was guided partly by his Christian beliefs. As a teenager he spoke out against China’s slavery, ancestor worship and idolatry. In a speech in 1912 he said "the essence" of the revolution "could be found largely in the teachings of the church." Sun was a patriot who wanted to make China strong and self reliant using both modern technology and China’s human and natural resources. He was also a great admirers of rebels who formed secret societies and risked their life fighting against the Qing dynasty. In 1905, Sun developed a coherent guiding philosophy that became the guiding ideology for the secret society through which he carried out his activities. The "Three Principals of the People" combined elements of nationalism, socialism and democracy and asserted that government should be "of the People, by the People and for the People." His goals were first to end the Qing dynasty, kick out the foreign occupiers and develop a government with a strong central leadership based on socialist principals. Democracy would emerge, he believed, when China was ready for it. Sun operated out of Hong Kong, then a center of revolutionary activity against the imperial government. He led his first insurrection against the Qing dynasty in 1895 in southeast China. It failed and at the request of the government, Sun was kicked out of Hong Kong by the British. He sought refuge in Japan. Sun Yat-sen organized a secret revolutionary society and led or inspired periodic uprisings in southern China, all of which failed due to poor planning and lack of weapons. Sun himself narrowly avoided capture and certain execution several times. Sun spent much of his life in exile---in Hawaii, Japan and Southeast Asia---with a big price on his head. He traveled widely in Europe and the United States trying to secure money and drum up support for his cause and his uprisings. Sun was very persuasive and committed to his goals. He was able to raise large amount of money, mostly from overseas Chinese in North America and Southeast Asia. Sun Yatsen’s "Three People's Principles"
The Nationalist Revolution of 1911, which included the Wuchang Uprising and Railway Protection Movement, toppled the Qing dynasty. The Qing dynasty collapsed mainly due to weakness from within Qing government. Even though Sun wasn't in China when the Qing dynasty collapsed he played a part in the revolution by inspiring revolutionaries with his philosophy and putting pressure on the Qing government with the rebellion he inspired. On October 10, 1911, seventeen provinces formed a provisional government in Nanjing. Sun was selected as its provisional leader. Realizing he needed military support Sun formed an alliance with the military leader Li Yuanhong. On January 1, 1912 Sun was sworn in as the President of the newly formed Republic of China. He established a government based on the "Three People's Principle"
Amidst the anarchy that followed the collapse of Qing Dynasty, Sun made the bold decision of transforming his revolutionary society into a mainstream political party. The result: the Kuomintang (KMT or Nationalist Party), which emerged as the dominant political party in China. The Kuomintang won in China's first ever national elections in 1913 but didn’t hold on to power for long. The republic that Sun Yat-sen and his associates envisioned evolved slowly. The revolutionists lacked an army, and the power of Yuan Shikai began to outstrip that of parliament. Yuan revised the constitution at will and became dictatorial. Sun's power and charisma unfortunately was not enough to overcome the military muscle of China's divided warlords and the remnants of the Manchu army and forge China into a true nation. With the preservation of the republic taking precedence over his own ambitions, Sun relinquished power after only three months to Gen. Yuan Shih-kai, a commander in the Manchu Army who promised to get the Manchu's to surrender and install a republican government. Yuan Shih-kai had helped Sun's Nationalists to force the Manchu abdication. Once in power Yuan reneged on his promise and set about shoring up his power by murdering political opponents, ignoring the new constitution, ruthlessly putting down local uprisings and later named himself emperor of a new dynasty. After Yuan Shih-kai's death in 1916 the country once deteriorated into anarchy as fragmented states ruled by warlords fought for control. After the death of the Empress Dowager and the abdication of Puyi, China descended into an anarchy in which a weak republican government fought for control of the country against local warlords. The predecessors of the Communist party that existed at this time consisted of discussion groups at Beijing University who argued over points in the Communist Manifesto. After his ouster, Sun attempted to build a stronger political and military base. In 1914, while in Japan, he married his personal secretary, the American-educated Soong Ching-ling. She was 21 and he was 50. She held radical political views and was one of the Soong Sisters. See Madame Chiang Kai-shek. By 1923, Sun established himself in Canton with the backing of local military and political leaders and created the National Revolutionary Army, which welcomed both Chiang Kai-shek and the Communists. He served again briefly as the president of China and desperately sought help from the Western powers who turned their backs on him because they were preoccupied with the aftermath of World War I. The Russian Bolsheviks were only willing to help out though and they infiltrated China with Communists. Sun made a deal with Communist leader Adolfe Joffe at the Communist International on January 26, 1923 that allowed the Chinese Communist party to join the Kuomintang if they abandoned their Marxist goals and worked under Nationalist leadership. In accordance with the deal Communist party members were allowed to keep their Communist party membership and their weapons. The Communist party at this time was relatively small. Sun reasoned he could use the Communists to help him mobilize the Chinese masses in the countryside. Sun was convinced that he could keep the Communists in line with his organization. The Soviet Union agreed to secretly supply the Kuomintang with military advisers, arms, ammunition and political advisors that helped him strengthen the Kuomintang. They also helped Sun found the Whampoa Military Academy with Chiang Kai-shek as its superintendent. The May Fourth Movement helped to rekindle the then-fading cause of republican revolution. In 1917 Sun Yat-sen had become commander-in-chief of a rival military government in Guangzhou in collaboration with southern warlords. In October 1919 Sun reestablished the Kuomintang to counter the government in Beijing. The latter, under a succession of warlords, still maintained its facade of legitimacy and its relations with the West. 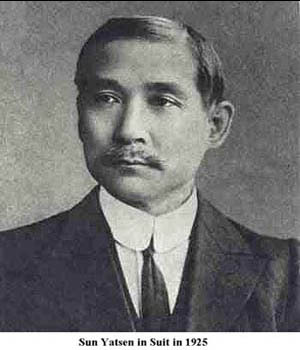 By 1921 Sun had become president of the southern government. He spent his remaining years trying to consolidate his regime and achieve unity with the north. Sun's plan was to expand out of Canton and link up with supporters in northern China and unify China. In 1924, he was invited by northern military leaders for discussions in Beijing on the reunification of China. Sun was very ill when he arrived in Beijing. Doctors discovered he had malignant liver cancer. He died on March 12, 1925 at the age of 59 and his efforts to form a lasting democratic China were nipped at the bud. Sun's body was used as a political symbol. It was preserved and kept in a temple just outside Beijing. Loudspeakers played recordings of his speeches and images of Sun were flashed on a screen as crowds came to look at the body. After he became head of the Kuomintang Chiang Kai-shek ordered construction of an immense mausoleum for Sun in the new capital of Nanjing and transported his body there with great fanfare. Sun's philosophy became the guiding ideology of the Kuomintang and later Taiwan. Text Sources: Asia for Educators, Columbia University afe.easia.columbia.edu; New York Times, Washington Post, Los Angeles Times, Times of London, National Geographic, The New Yorker, Time, Newsweek, Reuters, AP, Lonely Planet Guides, Compton’s Encyclopedia and various books and other publications.